This post was selected as Best of the Web by SAVEUR.com! 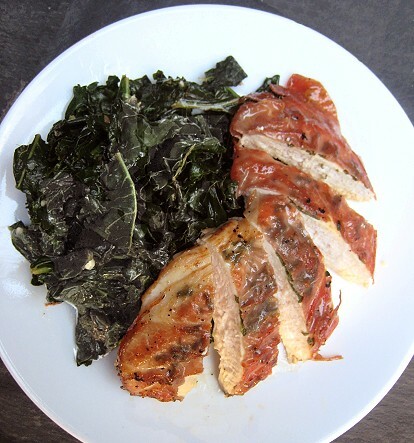 I had a craving for somethin-saltimbocca the other day and the easiest thing to have jump in my mouth was some chicken breasts left over from the weekly butchery. This is a fairly straightforward recipe and everybody can do it. As a matter of fact, I caught the episode of Jamie's Ministry of Food where Jamie Oliver taught this dish to people who have never cooked before, which they have been able to replicate in 10 minutes. He called it "chicken prosciutto," because he used a bunch of different herbs in between the chicken and prosciutto. I chose to do the traditional sage and prosciutto combination for my meal. Our garden is not thriving this year, but the sage plant we planted a couple of months ago seemed to be adapting well enough. I picked a handful of leaves from the plant. The dish came together pretty quickly. You don't even need a recipe for this dish, because it really is very, very straightforward. Step 1: Unlike our previous adventure with chicken breasts (Chicken Marsala), I actually pounded each breast this time to make its thickness even. Step 2: Then, I placed a single sage leaf in the center of each piece and sprinkled some of the chopped up leaves around -- because, you know, I wanted to get the sage flavour with each bite. Step 4: Place down in the pan. After a bit, flip. And that was that. 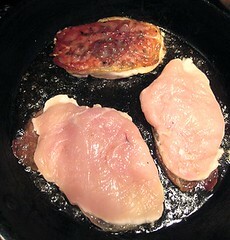 I did not even need to salt the chicken breast because the prosciutto is quite salty. 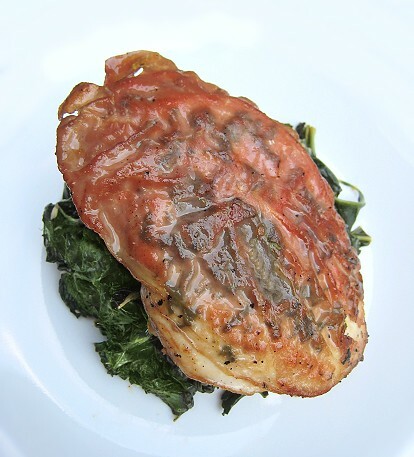 I believe saltimbocca comes with a butter-y, wine-y sauce, but really, this was already very good as is, that we didn't even feel the need to make one. Look at how succulent that chicken turned out. These had no trouble "jumping into our mouths" at all. We served this with some simply sautéed kale and called it a meal. 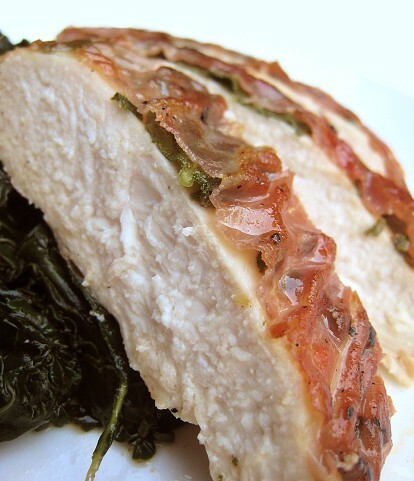 What a great idea to replace veal with chicken for this saltimbocca!! I love it! 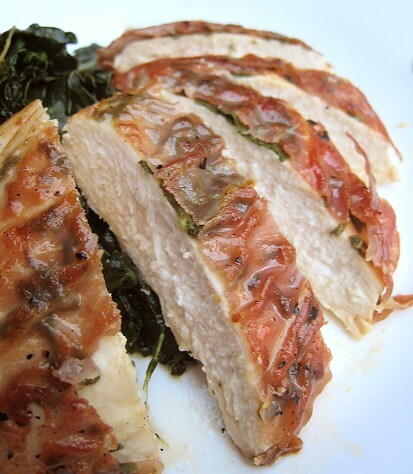 Saltimbocca is a fav of mine. I like veal as well as chicken. 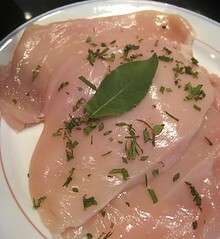 Your chicken looks perfect, juicy and tender. I'm gonna have to have some this weekend I think. your names for the photos are hilarious. 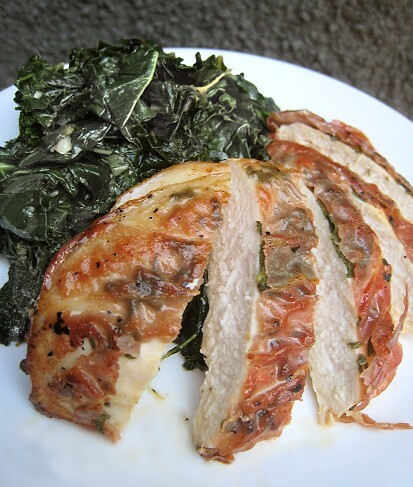 The chicken looks so good with that prosciutto 'skin'! Looks delicious and I love the use of prosciutto in this! That is some pretty awesome plating :) I love easy chicken recipes like this. The simple sage and prosciutto is such a tasty one! Haha, yeah, that chicken is ready for blast-off! Hehe... I guess we inadvertently made a trompe l'oeil dish. On first glance, I thought the prosciutto was chicken skin. 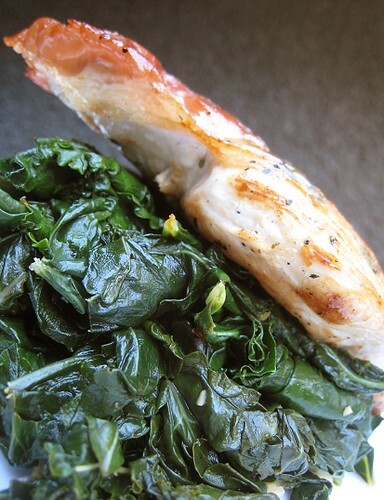 I thought you stuffed leaves between the chicken and its skin. Hmm. 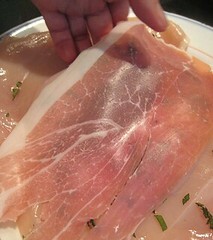 Prosciutto and sage leaves underneath skin would probably be really good.